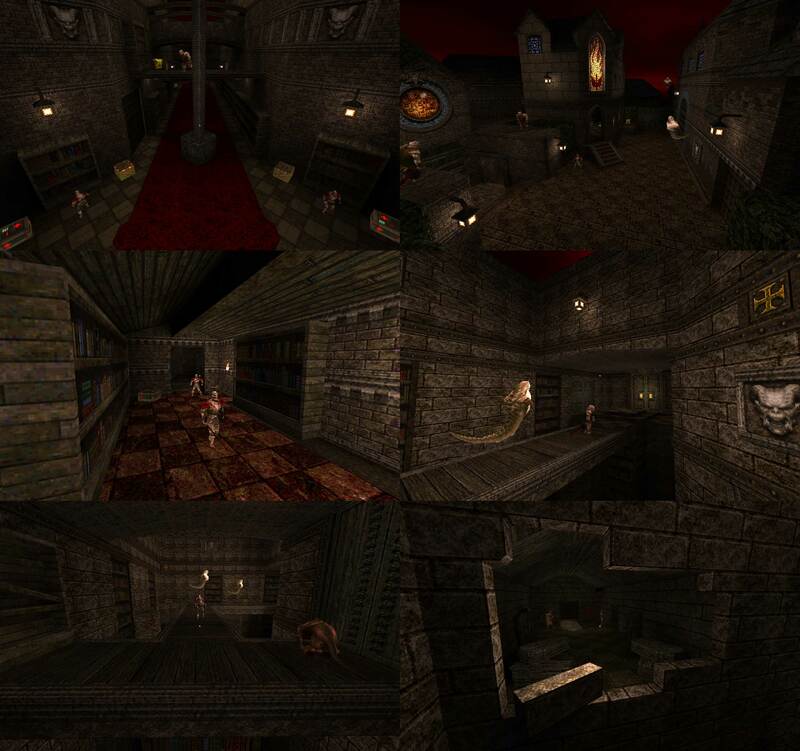 Description: A knave-style map with in mostly outdoor areas. Comes with custom music and skybox. Note: My first ever map, but not my first release! This project is mainly me figuring out the do's and do nots of Quake mapping in TrenchBroom. Because of the ingame music limitations, I recommend making a new folder instead of using id1, see instructions. Thought I recorded a skill 2 demo but apparently I didn't. some really nice details and setting etc here. Some aspects could use some more refinement (eg lighting) but overall very nice for a [not] first release. Really liked some of the semi-functional elements, the way you could see other buildings outside of play area etc. I think the lighting change around the gold armour was intended to help with player routing or whatever, but I wanted to poke around there to sort out secret after I killed everyone. Found ring of shadows thats it. Almost died at tarbaby. The custom music is a nice touch and sounds good with Quake. The map was enjoyable and I liked the atmosphere, progression and the outdoor areas were prettty cool, making me feel as if I was actually in a place called East Ardougne, wherever that might be. I made a demo of my first attempt if you want to see a noob get owned. Died a 3rd of the way through by falling off a ledge into the foulness. I made it much farther with my second attempt. Died right after killing the shambler, but didn't record that one. The lighting is all done by hand and is something I struggled with. Also all the texture alignment was done by hand, didn't know to alt-click in trenchbroom! The buildings you see outside the play area is actually something I don't recommend, VIS takes ages! But I really wanted to make a bigger environment like a 3d skybox. Good size, good re-use of layout, outside bits and buildings nicely styled. Combat good although armour placements a bit weird. Lighting a bit flat but that's about it. anyway, good solid map, maybe a bit hard for me personally, but then again I'm not very skilful player. It felt like I was struggling with ammo all the time, but other than that its all good, challenging and well made. DelusionalBear I congratulate you on pushing through! The secret door bug is something I can't really figure out, but I assume the angle on the brush is the problem. Stylin on the shambler with the axe kill in the end! GG and I think you did great. A really nice map man! The music is awesome as well. I just uploaded my play through on youtube if you wanna check it out! Finally got a chance to play this map. Here's a skill 1 demo. I made it through pretty much unscathed but almost fell off a few times. So much to like about this map. Your lighting is really solid and the set pieces and pacing were really great. Highlights for me was the ring of shadows secret that allowed me to sneak past some enemies and then head back when I needed help to dispatch them. The the area behind the silver door was a nice change of scenery. Cool surprises and I like the rising staircase. I think the only issue was lack of nails. Was getting bored of using the shotgun.. but a very minor gripe. It's really fun to get all the visual feedback from all the demo's, gives me laughs every time and insight of player vs AI behaviour! When I first started I made heavy use of the rotation tool. This made for some ugly cracks in the ceiling above the first button. Some other stuff like narrow platforms may look cool, but are janky to walk over with the players speed being so high. This has been an amazing learning process! This was good, loved the lighting and resuse of space, love the silhouette details in the distance, among other things. This was a really sweet map! The atmosphere and brushwork were excellent - the skybox and music really helped in that regard. My favourite areas would be the inner hallway with the red carpet, the thin bridge over the dark void, and the courtyard with the ogres on watchtowers - but what I especially loved was how they were interconnected, and in a creative way, too, which kept the pace high and the flow smooth. Overall, a solid 7/7, my only nitpicks being that you could get stuck on that arching walkway with the Death Knight and permanently stuck on the first secret with the moving bookcase and wall tile. Thanks for the video feedback :) You guys really flew through the map!